Gary Campbell just send us over these photographs he took of the Bridgeland House we designed for him and his wife Heidi. We're thrilled with how this project turned out. 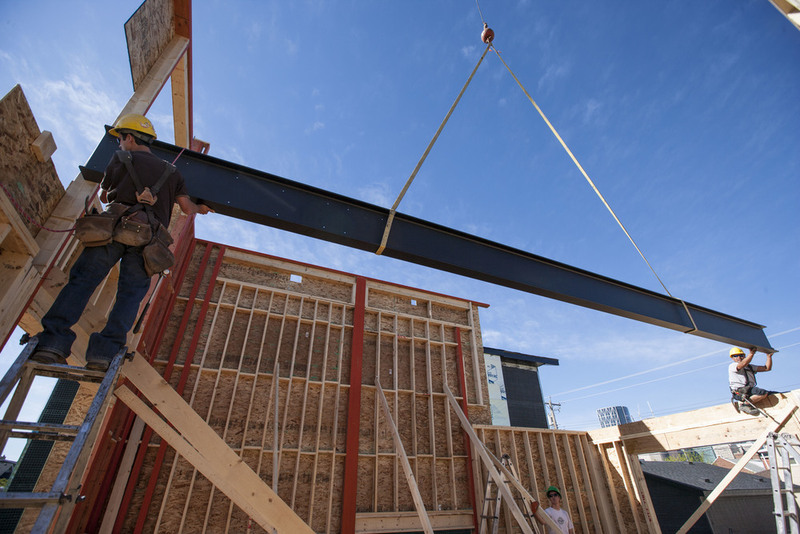 The steel beam has been a part of the design from the beginning. It's is of course integral to the raw aesthetic of the house, but it also does the actual work of holding the second floor up. The motif of the steel beam has been repeated in the stair stringers. This project started as a three storey house. As the design was refined, the third floor was removed so the basement could get more light. However, keeping the same-level relationship between the indoor and outdoor spaces remained important. The result is a split-level back yard with the deck at the main floor level, and the garden a half flight lower. The house has no shortage of natural light. In addition to the large windows at the front and the rear of the house, high wide windows along the South elevation ensure that sunlight penetrates deep into the house at all times of day. Kudos go to Rusch Projects for executing this project so well, to McIntyre Bills for the interior design and materials selection, and to Gary and Heidi for their commitment and attention to this project the whole way through. If you're curious about the construction process, please look at our previous posts that go right back to demolition day on August 2015. The exterior is also being worked on this week: black Longboard is being installed. We'll get some pictures posted here as soon as we can get them. 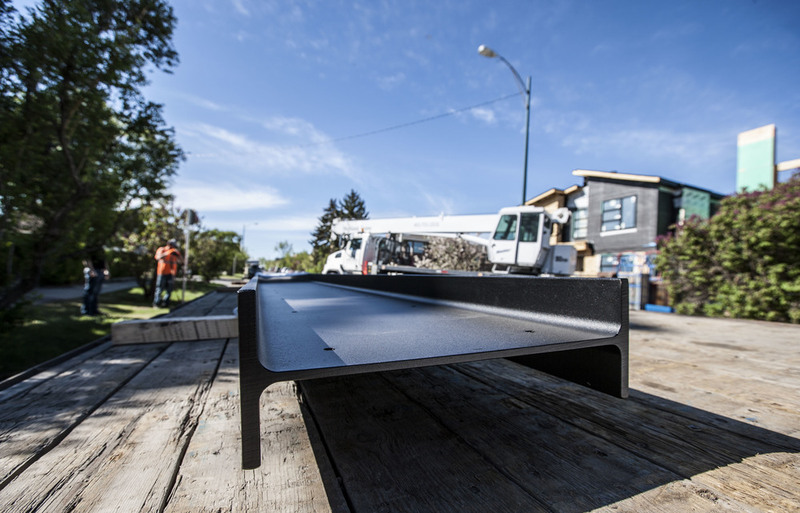 Maybe is seems strange to get excited about a chunk of C-channel extrusion, but it makes more sense when you know that it forms one of the steel stringers of the open-riser stair in our Bridgeland House. These stringers will be powder coated to match the exposed steel beam in the house and together will look awesome! Thanks to Gary Campbell for this photo. We're thrilled with the quality of light in the living room of the Bridgeland House! You can see in this image the steel beam that supports the upper floor which will be exposed in the stairwell and living room. The wooden stair in this image is temporary. We're looking forward to the matching steel staircase being installed. Thanks to Gary Campbell for this photo. Gary and Heidi's House so far—papered and meshed and ready for stucco. If you know Gary, you know that he is a creative, meticulous, and inquisitive man—which makes him an interesting client. Since Gary and his wife, Heidi, live just a few blocks away from their new house, let's just say they're on site more frequently than we are! 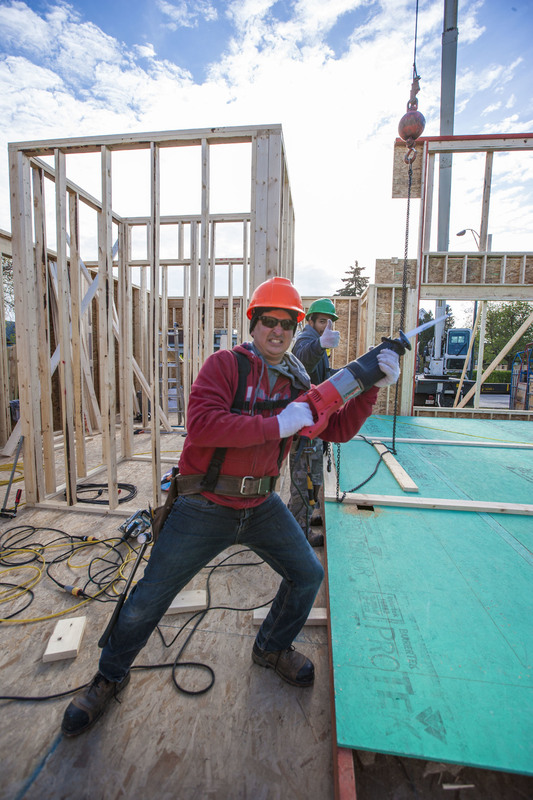 It's evident that Gary is fascinated with how complicated and intricate construction is, and their house is benefitting significantly from having such engaged clients! Gary explaining a kind of built-in storage unit he would like to incorporate in the design.... meanwhile, we're a little jealous of his view of downtown! Quite a lot has happened inside since our last post. The drywall is up and we got to see the mudder on his stilts finishing off ceiling edges. Can you imagine how impossible a task it would be without the stilts? These are ten foot ceilings! Gary and the Mudder - check out those stilts! 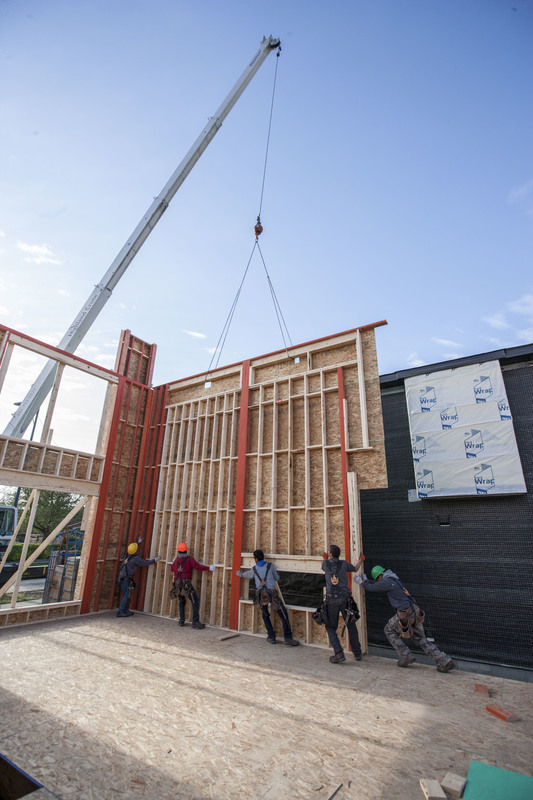 Gary's builder is Rusch Projects, and it's been a pleasure to work with them on this project. Just before we left, we ran into Phillip and Oliver from Rusch and discussed recent developments and brainstormed alternative solutions for a few design changes. We're going to see more of the steel beam that we originally anticipated! 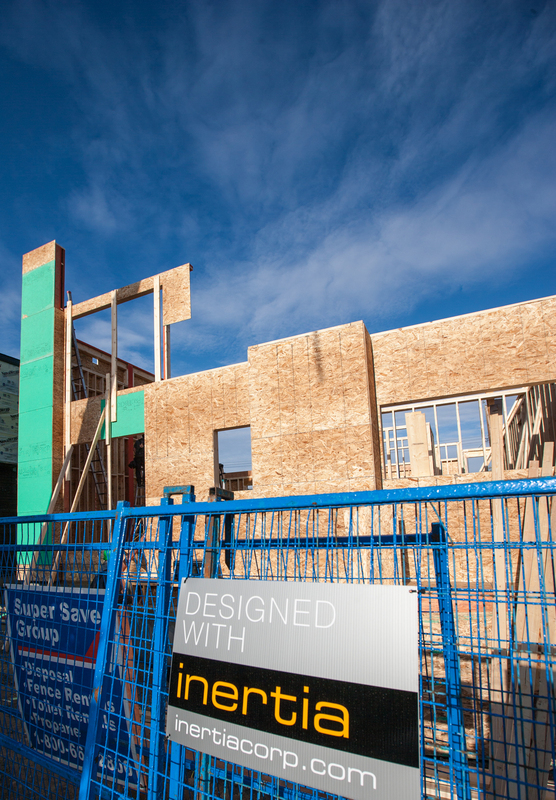 Progress continues on our Bridgeland House. Just the other day the garage slab was poured. It may seem like a basic thing, but it was more complex than it looks. Our neighbours' grade became higher than expected during their redevelopment. To avoid the possibility of their drainage collecting in our backyard, we wanted to raise our rear grade as high as possible. The grade of the back lane is fixed though, so any change in grade had to be transitioned over the garage apron and slab. But of course no-one wants to have a steep slope in their garage. The team at Rusch Projects were able to twist the apron just enough to raise the slab and therefore the backyard grade. 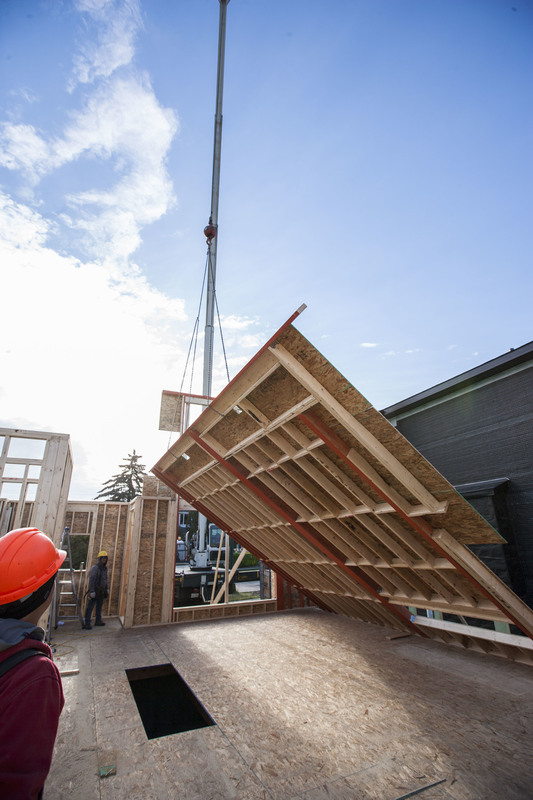 We were on site at our Bridgeland House yesterday for a final framing review and had a chance to see the framers load the basement stair. 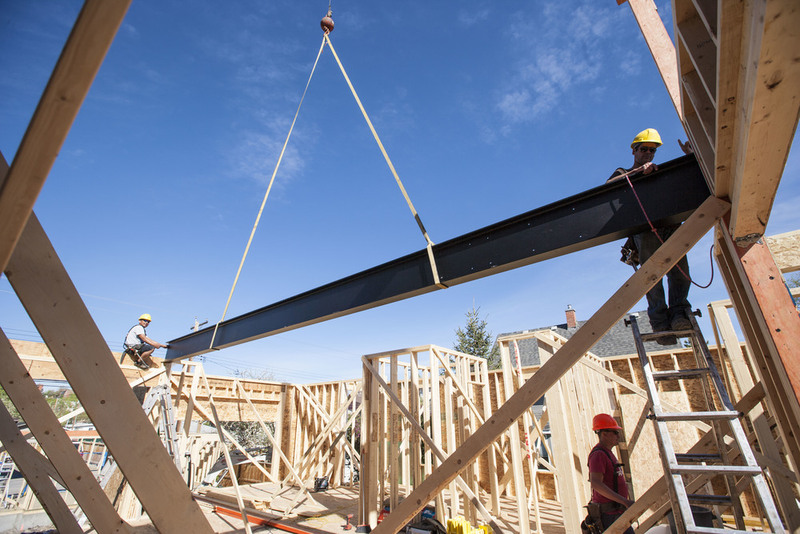 While it's not something you think about much when living in a house, it's a significant component that takes a lot of effort to load and install. However, we think the steel and timber stair that goes to the upper floor will be even more work. Compliments to Rusch Projects and their framing team for an excellent framing job! 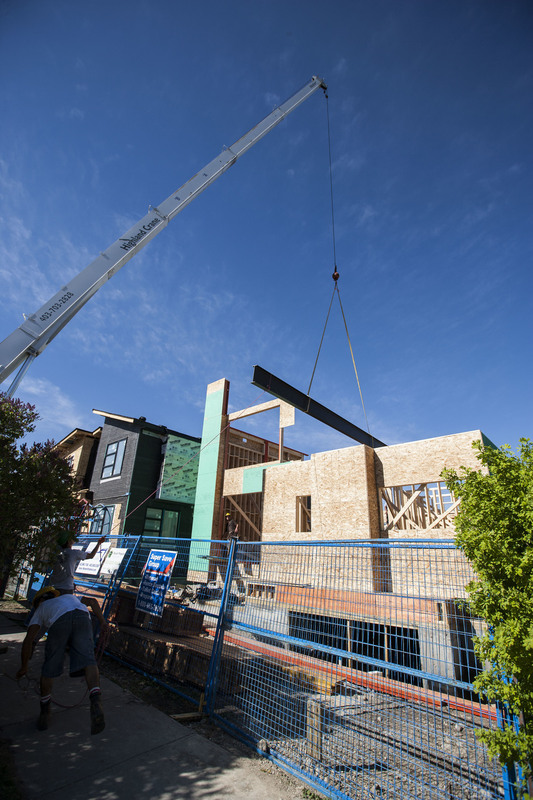 Progress continues on the Bridgeland House! 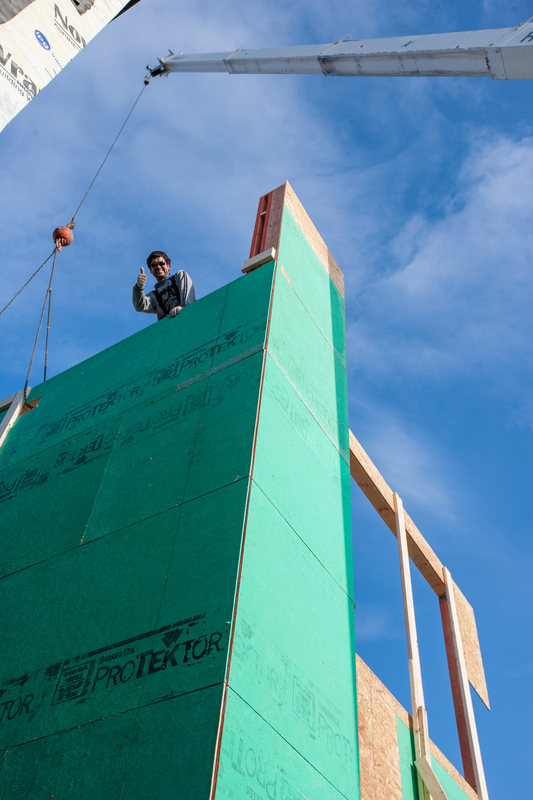 The garage is framed, the basement slab is ready to be poured, and the second floor is getting framed. Gary Campbell took these shots for us. 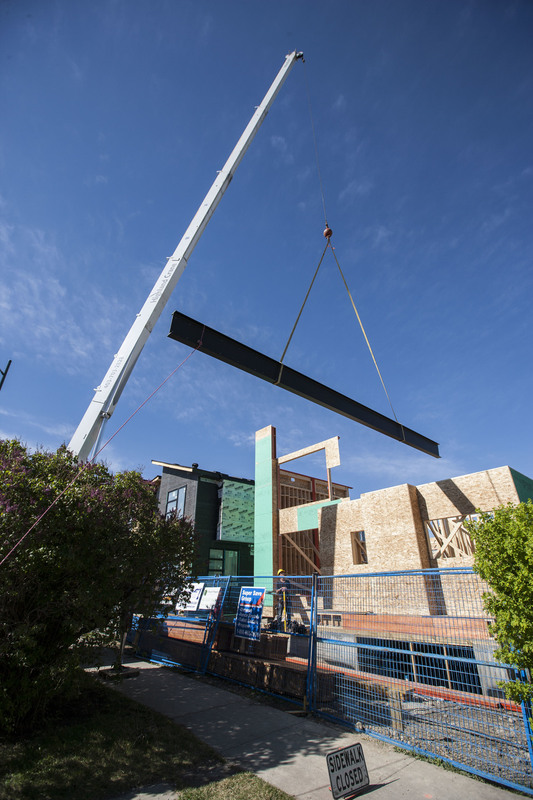 Last Friday the tall walls were craned into position on the Bridgeland House. Then, just yesterday the crane came back to place the steel beam. This beam supports the upper floor so that the main floor is completely free of posts. But the real reason the beam is there is to show itself off. The beam will be exposed at the stair which will also be made using matching steel stringers. Gary Campbell took all of these photos. When he first sent them, we thought we'd curate the best. But they make such a great slide show, we've included them all! 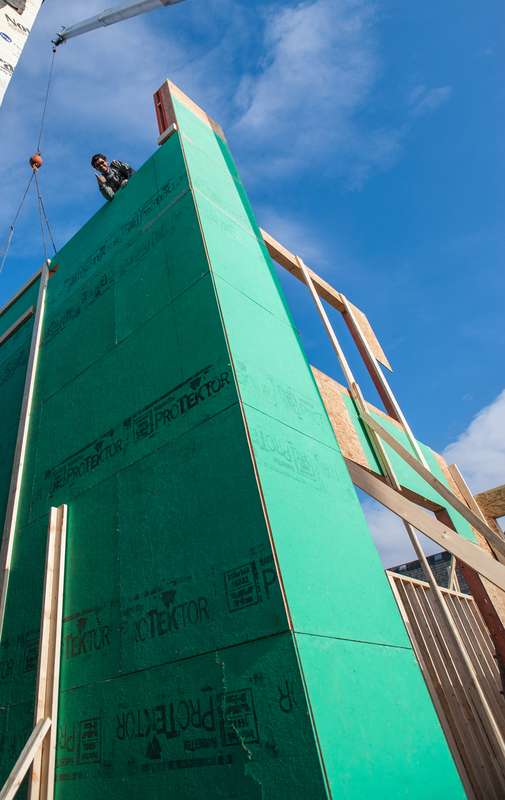 Over the last week, our Bridgeland House has had it's foundation poured. The following shots show the formwork in place, the pumper truck pouring the foundation, the stripped foundation, and the main floor plate almost complete. Thanks to Gary Campbell for the photos! Pumping concrete into the foundation wall cribbing. The formwork is stripped and loaded, ready to be craned away. The floor plate is almost complete. 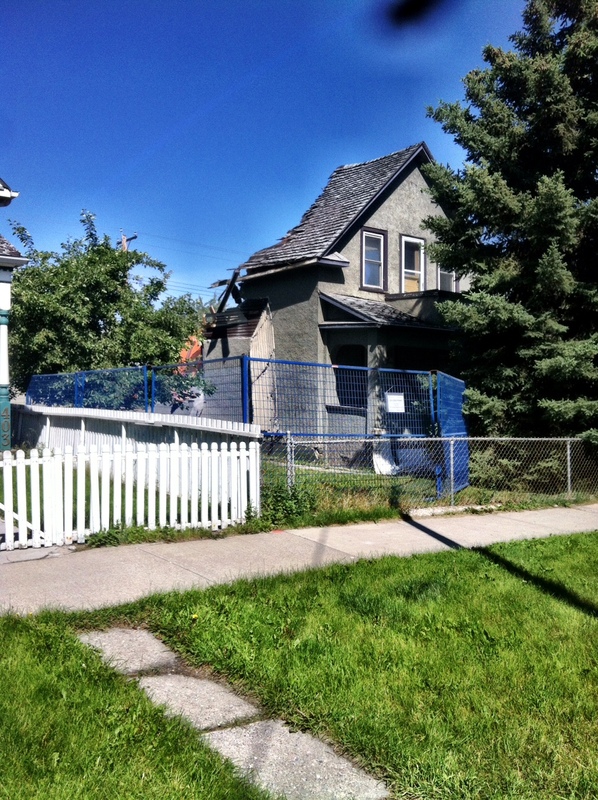 If you've been following this blog, you may recall an entry on the demolition of an old house in Bridgeland. Much has been accomplished since then. The Development Permit was approved and the construction drawings have been prepared. The owners, Gary and Heidi, have selected Rusch Projects as their builder and they have in turn applied for the Building Permit. Partial permit in hand, Rusch has fenced and excavated the site and will soon lay out out the cribbing for the footings. 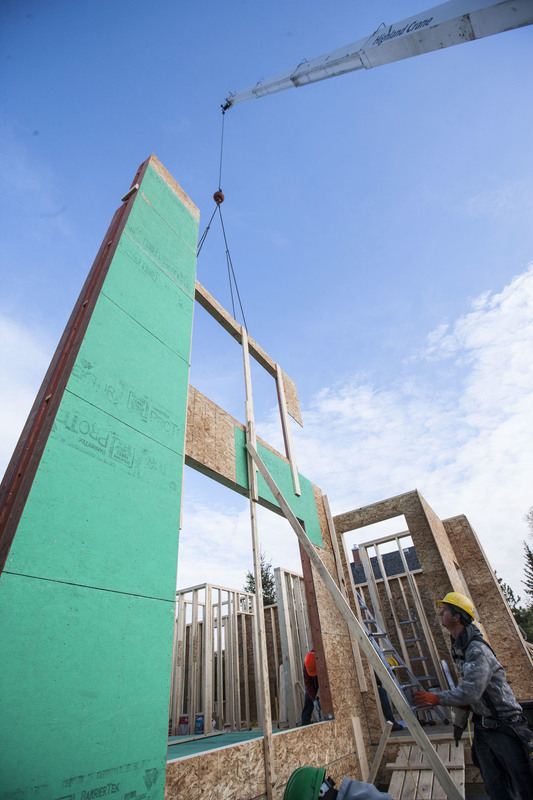 For those of you who are interested in the construction process, this blog will have regular entries illustrating the building of a single family house that Inertia designed for Gary Campbell and Heidi Wagner. Currently, we have a Development Permit submitted and are awaiting the first review (DTR) from the City. To bring you up to speed, this post include photos (and a video) from demolition day on June 25, 2015.